Berries and leaves of American beautyberry, Callicarpa americana, on Pinedale Farm. The Mississippi farm was once owned by John Rives Crumpton, grandfather of ARS botanist Charles T. Bryson. Regional wisdom once imparted by a Mississippi grandfather has led ARS scientists to isolate a natural compound that in laboratory tests was effective in warding off mosquito bites. The efficacy of the isolated compound—called “callicarpenal”—was affirmed through tests simulating human skin. But these results may not have been a surprise in northeastern Mississippi as long as a century ago, once the source of the callicarpenal was revealed. 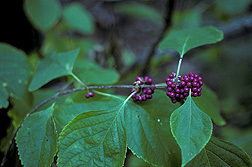 Seems that it was known there that fresh, crushed leaves of American beautyberry, Callicarpa americana, in the family Verbenaceae, helped keep biting insects away from animals such as horses and mules. Placing crushed beautyberry leaves under the animals’ harnesses, residents knew, would mash out a repellent oil. Eventually, some folks there took to mashing the leaves and rubbing the residue on their own skins. Privy to this knowledge was young Charles T. Bryson, who was told about it by his granddad, John Rives Crumpton. Today, Bryson is a botanist in ARS’s Southern Weed Science Research Unit at Stoneville, Mississippi. And he’s told researchers in ARS’s Natural Products Utilization Unit at Oxford, Mississippi, about beautyberry’s powers. This led Oxford chemist Charles Cantrell—with entomologist Jerome Klun of ARS’s Chemicals Affecting Insect Behavior Research Laboratory in Beltsville, Maryland, and Oxford plant physiologist Stephen Duke—to isolate from American beautyberry and a Japanese counterpart, C. japonica, five insect-repelling compounds. DEET, the world’s most-used insect repellent, was itself developed by ARS for the U.S. Army decades ago. “In laboratory tests, isolated callicarpenal was just as effective as SS220 in preventing mosquito bites,” says Cantrell. Those tests were conducted by Klun against the mosquito species Aedes aegypti, which is best known as the yellowfever mosquito, and Anopheles stephensi, which spreads malaria in Asia. Klun used the same system he used to test SS220: a six-celled, in vitro bioassay he and colleagues developed that evaluates bite-deterrent properties of compounds intended for human use. It consists of mosquito-holding cells positioned over compound-treated cloth covering six blood-membrane wells. The number of insect bites through the cloth determines compound effectiveness. Cantrell says a patent application has been submitted for callicarpenal. Subsequent work will include tests against ticks and developing ways of producing large quantities of the compound, either through synthesis or crops. Toxicity trials will precede any testing on humans.—By Luis Pons, Agricultural Research Service Information Staff.. This research is part of Plant Biological and Molecular Processes (#302) and Quality and Utilization of Agricultural Products (#306), two ARS National Programs described on the World Wide Web at www.nps.ars.usda.gov. Charles L. Cantrell is in the USDA-ARS Natural Products Utilization Research Unit, P.O. Box 8048, Oxford, MS 38677-8048; phone (662) 915-5898, fax (662) 915-1035. Jerome A. Klun is with the USDA-ARS Chemicals Affecting Insect Behavior Laboratory, 10300 Baltimore Ave., Bldg. 007, BARC-West, Beltsville, MD 20705-2350; phone (301) 504-9388, ext. 537, fax (301) 504-6580. "Folk Remedy Yields Mosquito-Thwarting Compound" was published in the February 2006 issue of Agricultural Research magazine.